2017 Scott Dunbier Awards: The Winners! Voting for the 2017 Scott Dunbier Awards concluded at midnight on January 31 2018. Complete votes can be viewed on the voting page. Here are our 2017 winners. Jack Kirby’s Fantastic Four: The World’s Greatest Artist’s Edition, designed by Serban Cristescu. Jack Kirby’s Fantastic Four: The World’s Greatest Artist’s Edition, editing and production by Scott Dunbier. 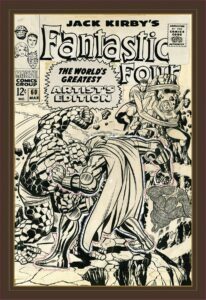 Jack Kirby’s Fantastic Four: The World’s Greatest Artist’s Edition, edited by Scott Dunbier. Most purchased book was, no surprise, Jack Kirby’s Fantastic Four: The World’s Greatest Artist’s Edition. A hearty congratulations to IDW, Scott Dunbier and Serban Cristescu. I didn’t vote this year: didn’t want to skew the data in any way. I really wasn’t expecting this complete landslide of one book taking every category. It was the first year for Fantagraphics Studio Editions and they had a very strong showing. We had between 77 and 95 voters for the six categories. Apparently people felt most passionately about design and least about reproduction and scanning quality. Our 87 voters in purchases bought 465 books in total, for an average of 8.79 AE format books. That’s a substantial investment in this format. Dark Horse received four votes for best publisher, even though they didn’t release an AE format book in 2017.